Gabby Thomas's well-chronicled rise takes a step forward at the 24th edition of the New Balance Grand Prix at the Reggie Lewis Track and Athletic Center. The Harvard sprint sensation, by way of the Williston-Northampton School, makes her professional debut in the 300m in front of a nationwide audience at the only United States based event on the IAAF World Indoor Tour. Thomas joins Massachusetts interests, Natick's Grace Connolly and Arlington's Ryan Oosting, who will be racing for top honors in their respective junior mile competitions. "I'm undoubtedly excited to make my debut here at Reggie Lewis, " said Thomas prior to her Saturday afternoon start. "Interestingly, this will be the first time that I compete at this facility," she added. 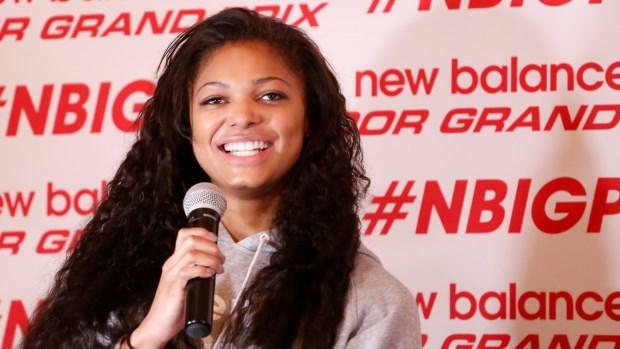 Thomas nixed her final year of eligibility; signing a multi-year pro contract with New Balance that runs through 2022. The recently turned 22-year-old will be guided in her nascent pro career by a familiar face in Harvard sprint coach and mentor Kebba Tolbert. While competing for the Crimson, the Florence, MA native collected 23 individual and relay championships as well as registering five All-American designations. Thomas originally had her mind set on playing soccer at Williston Northampton, but that dynamic shifted promptly when she conquered the New England Prep School Athletic Council Track and Field (NEPSAC) Outdoor Championships 100-meter crown as a seventh grader. Lining up against significantly experienced competitors, the energetic Thomas, an 11-time NEPSAC champion. would go on to garner five consecutive 100m titles in her prep career. Prior to competing in six European meets over the summer, which included the IAAF Diamond League Final in the Belgium capital of Brussels. Thomas, a neurobiology major plans to seek a Masters degree in public health.concluded her junior year as the undercover WL at 200m following a 22.38 clocking at the NCAA Division I Championships, last March. The only collegiate athlete in the field, Thomas made her Diamond League debut in Lausanne Switzerland on July 5th, collecting an impressive victory at 200m in 22.47. Moving ahead, Thomas sees the 200m as her signature event on the international scene. "That's what the plan is, hopefully, to improve in that area," she said. A field of 11 is set to accompany Connolly to the line in the prestigious Girl's Junior Mile including Margaret Donahue (Wellesley High School), who clocked a 2018 indoor best of 4:57.86 at the New England Indoor Championships, Newton South HS Junior, Lucy Jenks (1:35.20 at 600m in 2019) and Littleton HS senior Sarah Roffman who enters competition with a high school career indoor best of 5:00.03 (2017). Oosting leads the local contingent against a stacked field of milers along Brookline HS Senior Lucas Aramburu and Rishabh Prakash (Burlington HS).